Atlas Electric specializes in low and medium voltage motor control with a huge inventory in all of the leading brands. We can supply you with new, surplus and reconditioned starters, parts and accessories in both current and hard to find obsolete models. Whether it is a replacement MCC bucket, complete MCC lineup, reduced voltage starter or UL 508A listed custom control cabinet we carry it all. 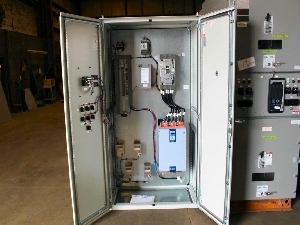 Two each NEW SURPLUS WEG 500 HP 480 Volt Soft Starters (250 HP 240 volt, 650 HP 575 volt) Combination type with 800 amp Molded Case Circuit Breaker, SSW060604T2257ESZ Soft Start includes Integral By-Pass Contactor, Door Mounted Tecsystem NT538 RTD Monitor, 3000 W Cabinet Space Heater, E-Stop PB, Start PB, Stop PB, On Ind. Light, Run Ind. Light, Fault Ind. Light, High Temp Ind. Light, NEMA 4 Enclosure. Atlas Electric can modify and customize these starters to suit your application. Model Number: CR194A118L2 Manufacturer General Electric Contactor Amps 760 Contactor Catalog Number CR193E110L005050U Voltage 4160 Enclosure N-1 Date Manufactured 2008 Condition Used General Electric Limitamp Medium Voltage Motor Control Center with an incoming section, 2 each 400 amp starters, 1 each spare 400 amp starter cell, 2 each 760 amp starter. The starters have Vacuum Contactors Catalog Number CR193D110L00505AR (400 amp), CR193E110L005050U (800 amp), and General Electric Multilin 469 Motor Protection Relays. Atlas Electric can reconfigure and modify into lineups that suit your application. More Used Equipment from Atlas Electric Inc.
See More Equipment From Atlas Electric Inc. Featured Listings From Atlas Electric Inc.
View more about Atlas Electric Inc. on SupplyMine.